Cliff erosion will increase in the absence of, or a low, beach elevation, or during periods when the height of the sea is greater than the toe elevation. These conditions generally occur during high tides, storm surges and or storm waves. The development of offshore banks act to reduce wave height shoreward, hence reducing the elevation of the sea at the coast. However the effectiveness of this process depends on the depth of water over the bank. Hence, evolution of offshore banks and changes in the elevation of the bank crest over time will act to moderate the effects of storms to a greater or lesser extent. Similarly, absence of a beach or lowering of beach elevation over time will control cliff toe erosion (Lee 2008). The figure below shows bathymetric change in the area around the site. Red is erosion, blue is deposition. 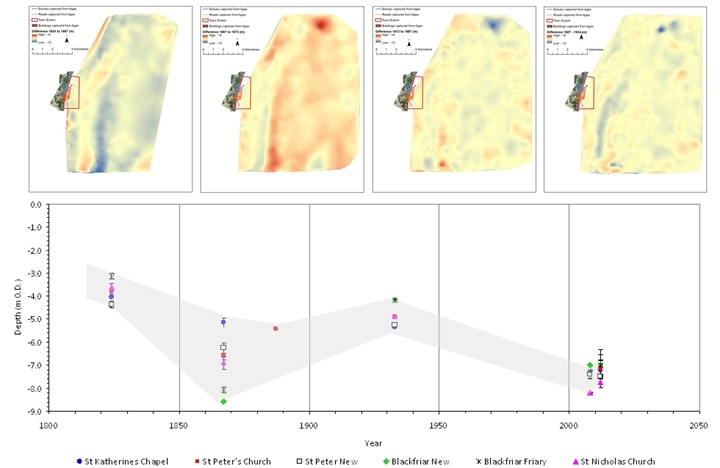 Historical change in seabed based on bathymetric chart analysis. Data is based on converting all old bathymetric charts to the same chart datum and then extracting the depth for each pixel over the area of each ruin. The grey lines represent the range of the data. Deeper values show there was less sediment over the site. Thus in the early 19th century, the ruins were largely covered by sediment, whereas they were exposed during recent surveys. Note the increase in sediment (decrease in depth) over the sites between 2008 and 2012. Coastal change analysis was based on using all available, accurate maps of the coastline for Dunwich. In total 13 coastlines were used, following an assessment of the accuracy of their cartography and georectification. The digitized coastlines were then input into the USGS DSAS system (Digital Shoreline Analysis System) and a baseline set landward of the current cliffline. 20m transects were set perpendicual to this baseline and a point identified at each place where the transect intersected a coastline (Figure 1). 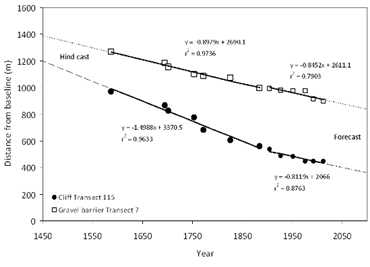 For each transect a linear regression model was built for the period before and after a major change in cliff retreat dating from c. 1925 (Figure 2). Accuracy of the models is mainly influenced by the assumption that rates over time are consistent with those experienced over the period for which data is available. Figure 1: Digital shoreline analysis process. Vertical lines are the Baseline and the digitized cliff lines (Top of cliff). Horizontal lines are the transects used to extract cliff line position. 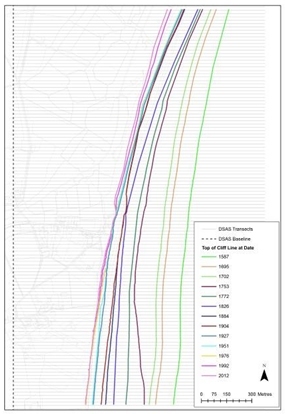 These data were then used to generate individual linear models of cliff retreat for each transect. Figure 2: Example of the linear modelling of cliff line position relative to baseline for two transects along the Dunwich cliffs. Forecasts of cliff position in 2050 and 2100 were made using the most recent data. Hind casts back to 1050 were made using the older datasets. 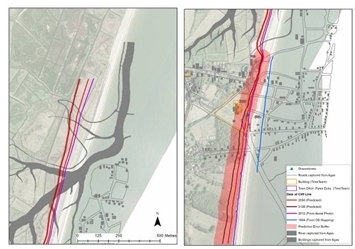 The results of the linear modelling of coastline retreat were used to identify future heritage at risk (Figure 3) and also to define the eastern (seaward) position of the town for dates prior to the last available map in 1587 (Figure 4). The latter were used alongside historical records of damage to the town to locate he boundary around the coastlines in 1250-1300. Prior to the storms of 1286/87 most damage to Dunwich was recorded as loss of land and damage to the harbour. During he storms of 1286/87 is when significant loss of buildings starts, indicating the coastline was then at the limits of the town. Figure 3: Predicted coastlines back to 1050AD based on coastal change analysis. The eastern limit of the medieval town was between the coastlines of 1300 and 1250 AD. Agas map and contemporary air photo shown. 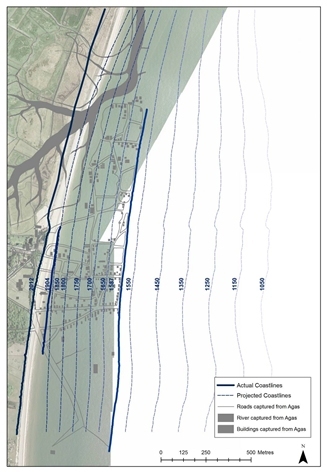 Figure 4: Forecast coastlines for 2080 and 2050AD based on coastal change analysis. Red buffer is the RMSE error in the forecasts. The main heritage loss in the next 60 years is likely to be the last parts of the old medieval and Saxon town including the Pales Dyke and the churchyard All Saints. The least conservative estimates suggest loss of the main grey friars buildings.